Dale greeted me on his mountain top garden. He could hear me coming up his steep, windy, and rocky driveway. 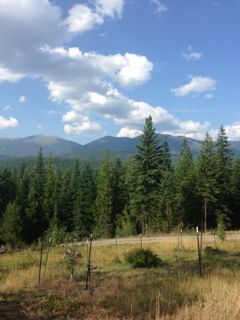 As I parked by his cabin, I felt like I was on top of the world; beautiful views every which way I turned. 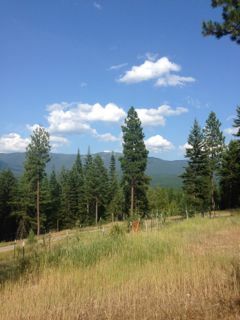 Dale bought this 25 acre property just outside of Bonner's Ferry in northern Idaho 9 years ago. For the first 5 years him and his wife Susan would come up for the month of July. Then 4 years ago Dale retired from his job as a school principal and now lives 6 months of the year here. He comes up in May and heads back to his Florida home in November. The best of both worlds. His wife is still working so she comes up a few time during the summer. 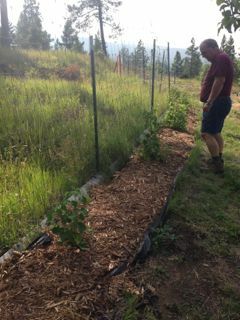 Dale says he started growing vegetables 4 years ago when he started spending more time at his mountain top garden. 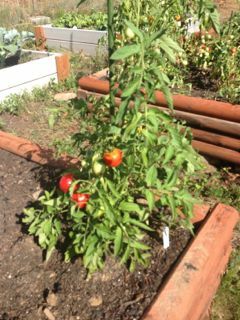 When they purchased the property there were 2 raised bed that the previous owners had used. Since then he added three more 4 foot by 8 foot beds and three 4 feet by 4 feet beds. The beds are made out of different materials as every time he expanded he found a better way of making the beds. The smaller ones are made out of railway ties, but he found this would make the larger ones very expensive to build. He got a great deal on some decking material that was not exactly straight; not great for decking but perfect more making garden beds. The mountain top garden area is fenced to keep out the wildlife, which is plentiful in this wilderness area. 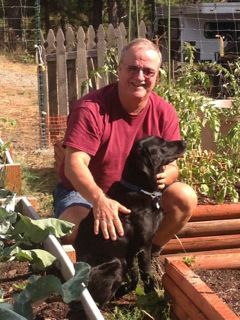 He grows what he loves to eat, this year he planted tomatoes, broccoli, lettuce, squash, peppers, beets, and celery. Unfortunately the celery and some of the beets were eaten by the pocket gopher. I was surprised to see red tomatoes so early in the season. 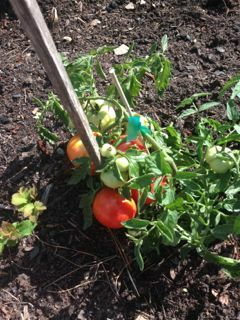 He says his tomatoes have grown really well since he started adding a bit of Epson salt to the area around the plants. He adds a scoopful when he plants them. He loves tomato sauce and has canned that along with some salsa. 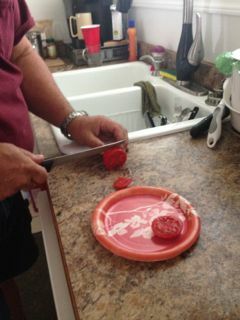 I tried one of his Kootenai tomato varieties and it was delicious. 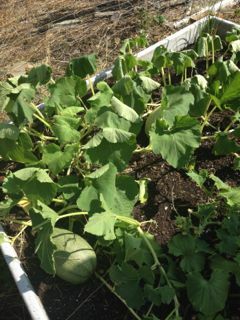 He is really please how his spaghetti squash is growing this year, 2 big fruits so far. 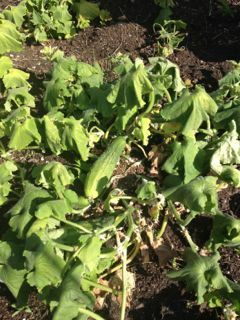 The cucumbers were forming, last year the gophers got those, so he is looking forward to harvesting these. 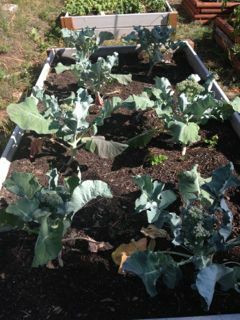 Broccoli has always grown really well, but not cauliflower; interesting as they usually need and want the same growing conditions. He read somewhere to cover the head of the cauliflower, my thought was he was covering the head too soon. 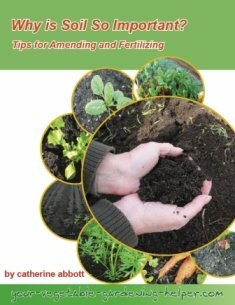 I also suggesting adding lime to the bed where he would be growing them next year. I hope he gives them another try. 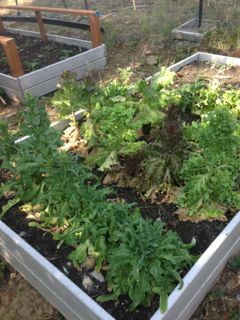 His lettuce was nearly done, just about going to seed, however we enjoyed a tasty fresh salad for dinner. 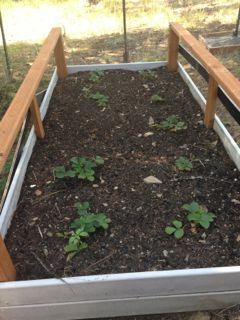 This year he extended the fenced garden area and planted a bed of strawberry patch. He had put up a support for netting as the birds also love his strawberries. 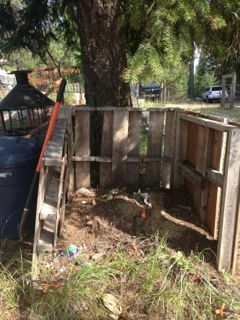 He does compost, however last fall the elk got into it and pretty much ate up all that was there. He is thinking of getting a rolling compost bin, feeling this may help to keep the animals from smelling it. Compost is a tough think with wild animals around as they can smell and love to forage for the scraps of food. 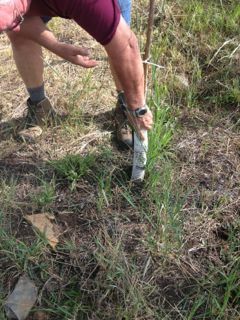 One of his biggest challenges and frustrations are the pocket gophers. 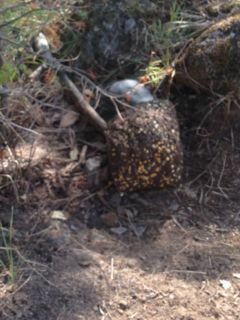 He has trapped nearly a dozen or so this season and they are still creating damage to his garden. Often you do not see them until the vegetable is gone, as they eat from the bottom of the plant. We chatted about putting strong wire mesh at the bottom of the raised beds and he definitely wished he had done this when he made them. His is strongly considering moving the soil next spring and adding the wire bottoms. He has a few beds that need more soil so is thinking of moving the soil from one of the beds to fill the other, putting down the wire then using the double dig idea by moving soil from the next bed to fill the empty one. It will be a bit of work, but I think will give him some piece of mind from the gophers. 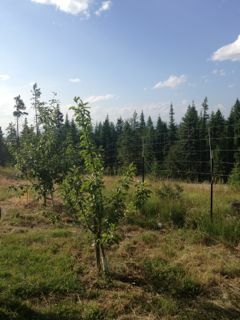 Dale has also started a fruit orchard on his property. He grew up on a dairy farm in Vermont called the “Wild Apple Farm” so has always wanted to have apple trees. 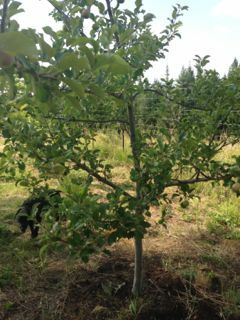 He has a few varieties planted – Fuji, Granny Smith, Red Rome Beauty and his favorite Honey crisp. They are all at various stages of growth as he has expanded and planted more trees each year. The larger trees had lots of fruit. He is trying his best to grow them organically. The first few years were challenging but the trees seem to be growing well. 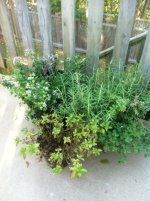 Part of caring for them organically is to observe any problems then spray with a organic spray, sometimes several times, which can get frustrating. This year he also planted raspberries and a cherry tree. He is creating a beautiful orchard for his mountain top garden. He lives and grows in the wilderness, so both the mountain top garden and orchard are fenced to keep out the wildlife. Dale jokingly said “they just walk by, as if my garden is not good enough for them”. 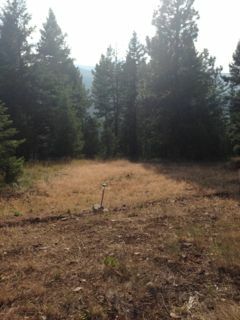 He does take good care of his wild neighbours, by planting a field of clover in early May (if he is here) and in mid August so the deer and elk have something to eat. He also provides then with a mineral block made with corn and a salt block. I am sure this is what keeps them out of the garden. Dale was generous in saying my website was helpful and he has enjoyed and learned some new things from the articles I have written about my other garden visits. Hooray, what I set out to do has worked, even if only for one person. 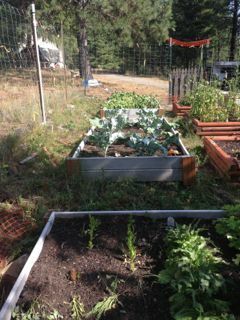 Dale's mother was a natural gardener, growing a huge garden, preserving and canning for the winter. He wishes he would have learned more from his mother about gardening, it would have made things so much easier. I acknowledge Dale for learning as he goes along, like most of us do. As far as I could see he is doing a great job with his mountain top garden. We spent a quiet evening eating a steak dinner, gazing at the mountain vistas, watching the sunset and hoping to see a deer or elk, no such luck. Just as I was leaving the next morning there was a deer munching away on the mineral block. As I am writing this I realize I did not take a picture, what was I thinking? I guess just enjoying the view in the moment was all I needed to do. Thanks Dale for your wonderful hospitality. 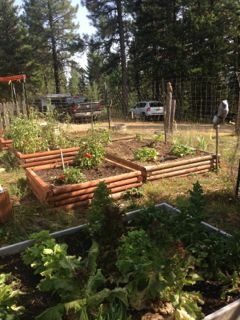 Return from The Mountain Top Garden to Organic Vegetable Garden.